Dutch oven cooking allows you to prepare the heartiest meals that are only achieved with cast iron cookware. Use this 2-quart, 8-inch Dutch oven for your family favorite recipes. This cast iron piece has a flange on the lid making it excellent for cooking with charcoal briquettes or wood. Best of all, each piece of our cast iron cookware comes pre-seasoned with our True Seasoned Finish, providing a natural, easy-release surface that is ready to cook on. Add this oven to your Dutch oven collection today. 10 ft. Cast Iron Deluxe Dutch Oven Cast iron Dutch ovens are known for making some of the most delicious meals, from slow roasted meats to your favourite fruit cobbler. When cooking with this deluxe six quart, 10" Dutch oven your menu will expand because the lid doubles as a full size skillet. Simply turn the lid over to cook eggs, bacon or pancakes, then replace the lid and start cooking your favourite potatoes for the next meal. 10 ft. 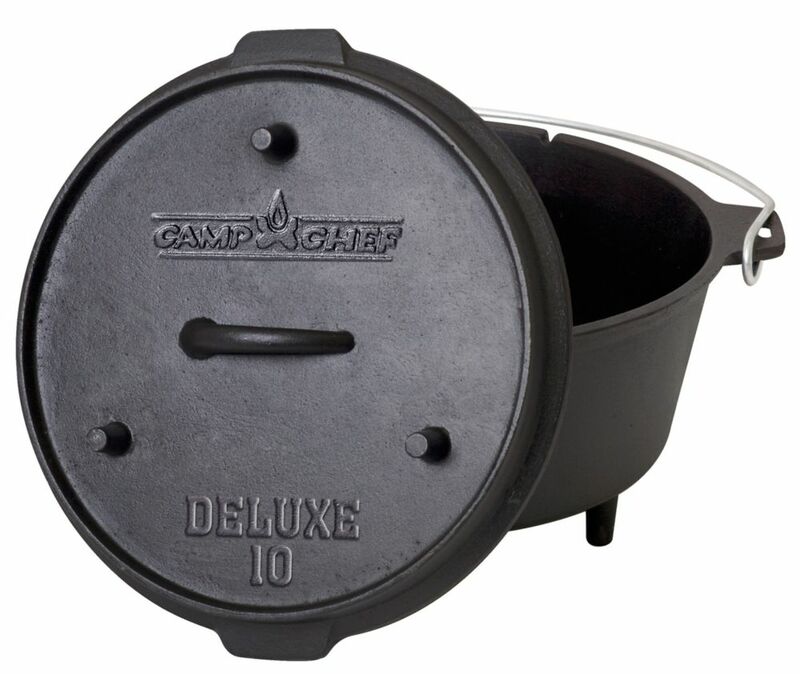 Cast Iron Deluxe Dutch Oven is rated 3.3 out of 5 by 3. Rated 1 out of 5 by Hikerjack from Oven had small crack in the bottom. Oven had small crack in the bottom. Rated 4 out of 5 by Miata94M from Love it! I love the fact the lid doubles as another pan. I was suprized to find out my pie pan doesn't fit in the dutch oven. Sinde the website doesn't tell you dimensions -- you just need to know it's a bit smaller around than the standard style. Rated 5 out of 5 by Anonymous from 6 Qt Dutch Oven Super product. Does everything it's designed to do. I have 5 of these exact same product. Just keep finding more things to cook in them!! Used it last w/e on our outdoor patio where we have a fireplace while we were watching football games. When games were over food was ready. Even had some neighbors who evjoyed it with us.